Tickets for the Staatliche Museen zu Berlin are reasonably cheap with good combination deals. Buy museum tickets and reserve online to save even more. Tickets for the Staatliche Museen zu Berlin (State Museums) are very reasonably priced for the quality and quantity of artworks and cultural objects on display. The most expensive museum is €19 but most are cheaper and many combination deals are available. Tickets are sold for individual museums (or special temporary exhibitions) but the area combination tickets are especially good value for money and always a great savings deal when seeing more than one museum on a single day. These national museums are included on the Berlin Museums Pass and some Berlin Welcome Cards. Buy tickets online from Tiqets or GetYourGuide to save even more and make free time-slot reservations where required. Tickets for the Berlin State Museums are at first glance fairly complicated. Several combination tickets are sold and the museums are also included in tourist museum passes. Tickets are generally available for special temporary exhibitions, for an individual museum, for the whole area the museum is in, and for all museums. The area tickets are generally good value and are only marginally more expensive than a single museum ticket. The museum ticket almost always includes admission to temporary exhibitions, although sometimes it is extra, or a separate cheaper ticket is available for the temporary exhibition only. Admission to the Berlin State Museums is free for children up to 18 years old but they need a ticket too so include children when buying tickets or making time-slot reservations. Students usually pay the reduced (ermäßigt) half-price rate. All visitors can buy tickets online from the museums but this option is currently in German only and require registration or a surprisingly amount of personal data. Buying from Tiqets or GetYourGuide is a lot simpler, the same price and valid as mobile phone ticket. The online reservation system for free time-slot tickets where required can also be used for child tickets and annual pass holders. Note that day tickets are valid for the calendar day, irrespective of the time of purchase. It is therefore best to buy museum tickets early morning and avoid Mondays when only the Pergamonmuseum and Neues Museum are open (although both can easily fill a day). 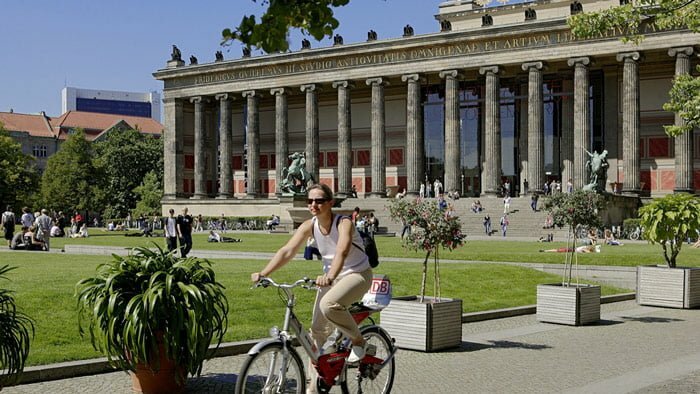 The area day ticket for all museums on Museum Island is €18 (buy online) – note that both the Pergamonmuseum and Neues Museum require time-slot admissions – free booking online at SMB Shop. The Friedrichwerdersche Kirche Church is closed indefinitely due to structural issues. €19 – Pergamonmuseum / Pergamon Museum (buy from Tiqets) – €6 surcharge to see the Panorama Exhibition if using the Museum Island ticket or other passes, such as the Berlin Museum Pass. Prices for the museums in the Humboldt Forum (Berlin Schloss) have not been announced yet. The Etnologisches Museum / Ethnological Museum and Museum für Asiatische Kunst / Museum for Asiatic Art should open towards the end of 2019. The area day ticket for all museums in the Kulturforum is €16. Admission is sometimes charged for temporary exhibitions in the library and Kupferstichkabinett. €10 – Gemäldegalerie / Paintings Gallery (Old Masters) (buy from Tiqets) – €4 surcharge for the Mantegna-Bellini exhibition in early 2019. €6 – Musikinstrumenten-Museum / Musical Instruments (not part of the SMK but included in the Kulturforum ticket). Only the Museum for European Cultures remained at Dahlem. The other two collections moved to the Humboldt Forum in the rebuilt Berlin Schloss on Museum Island – due to open in 2019. Combination tickets for the Berggruem and Scharf-Gerstenberg collection is €12. Admission to Charlottenburg Palace itself and the Photography Museum is not included in this ticket. The Museum Pass Berlin is sold by Visit Berlin – the tourist information office for €29 and is valid for entry into more than 30 museum in Berlin on three consecutive days. These museums include all Berlin State Museums, the German History Museum, and Technology Museum but unfortunately not the popular Haus am Checkpoint Charlie or DDR museums. The pass is available from any participating museum, tourist office, and some hotels. The Berlin Welcome Card Museum Island pass is a further option sold by the tourist office. This 72-h pass includes public transportation, free admission to the permanent collections of the Museum Island museums, and further discounts at other attractions. It currently cost €46 in the AB transportation region version – the ABC version that includes Potsdam, Schönefeld Airport and Oranienburg is hardly more expensive. €100 – Classic Plus: valid for all museum and temporary exhibitions at all times, priority admission even without time-slot reservations. €50 – Classic: valid for all permanent exhibitions at all times. Major temporary exhibitions may have a surcharge. Free time-slot reservations. €25 – Basic: valid for all permanent exhibitions at off-peak times, i.e. enter after 4 pm (3 pm at Dahlem and Schloss Köpenick) on weekdays and between 11 am and 1 pm on weekends and vacation days. Major temporary exhibitions have a surcharge. Free time-slot reservations. These annual passes can only be bought at the following museums: Altes Museum, Kulturforum central ticket desk, Hamburger Bahnhof, Museum für Fotografie, Museum Berggruen, Dahlem Museums, Neues Museum and Schloss Köpenick.